Tesla Motors announced expansion plans for the European Supercharger network at the Internationale Automobil-Ausstellung(IAA) in Frankfurt today. The company recently began delivering the Tesla Model S in Europe, and has installed the first European Supercharger stations in Norway. Next on their agenda is expanding the Supercharger network further, and delivering the Model S in more European countries. The Norwegian Supercharger network covers 90% of Norways population using just six Superchargers. 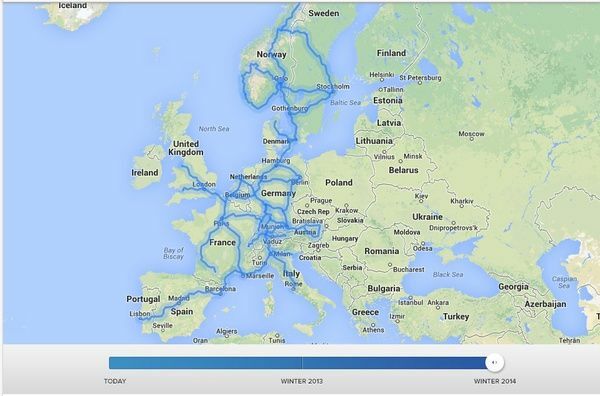 That's thanks to the long driving range of the Model S. Just as Tesla is rapidly expanding the North America Supercharger network, the European network is expanding. By the end of 2014, 100 percent of the population of Germany, the Netherlands, Switzerland, Belgium, Austria, Denmark and Luxembourg will live within 320 km of a Supercharger station, with about 90 percent of the population in England, Wales and Sweden living within the same distance of a charging station. Because the Model S has a 480 kilometer range, distributing the Supercharger station at 320 kilometer intervals is useful. Because other electric cars have a shorter electric driving range, the fast charging stations have to be more densely distributed. For example the recently announced Fastned charging network in the Netherlands is slated to require over 200 CHAdeMO fast charging stations in order to ensure the entire population of the Netherlands is within 50 kilometers of a fast charging station.